– Florida’s 2009 senior class…who go into Saturday’s game with a 45-6 record, tied for the SEC mark for winningest class in conference history. The SEC record of 45 wins is shared by the 1996 Gators, 1994 Alabama Crimson Tide, 1998 Tennessee Volunteers and 2005 Georgia Bulldogs. – Senior defensive end Jermaine Cunningham…who leads the team with seven sacks. – Senior linebacker Ryan Stamper…who is tops on the Gators with 61 tackles. – Senior kick returner Brandon James…who set the SEC record for kickoff return yards last week with 2,538 yards on 105 returns. James looks for a return touchdown this week. – Senior wide receiver Riley Cooper…who is looking to improve after dropping two touchdowns last week against South Carolina. He caught one. – Florida’s Nick Alajajian and Florida International’s Joe Alajajian…who are brothers. 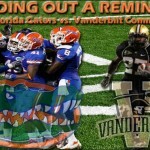 – The Gators are in the middle of the longest winning streak in school history with 20 consecutive victories. They also hold the longest active winning streak in the NCAA and the best in the SEC in the past 15 years since the Auburn Tigers won 20 straight from 1993-94. 19 of Florida’s 20 wins have been by a double digit margin. Florida is 10-0 for the third time in school history (1995, 1996). – The Gators lead the SEC in rushing offense (230.6) and third-down efficiency (.441). They also come in No. 3 in total offense (428.7) and scoring offense (33.9). 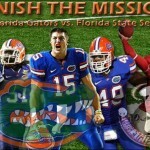 – On defense, the Gators have only surrendered ten touchdowns all season (fewest of any team in the nation). The unit has also only allowed 12 field goals for a total of 105 points (10.5 points per game) – this also leads the nation. – Florida tallied a season-high six sacks last week against South Carolina, including three within a span of four defensive snaps. – The Gators allowed a season-low 61 net rushing yards last week while also holding the SEC league leader in sacks, Eric Norwood, without one. – Florida has recorded 10 interceptions over the past four weeks, best in the nation. The No. 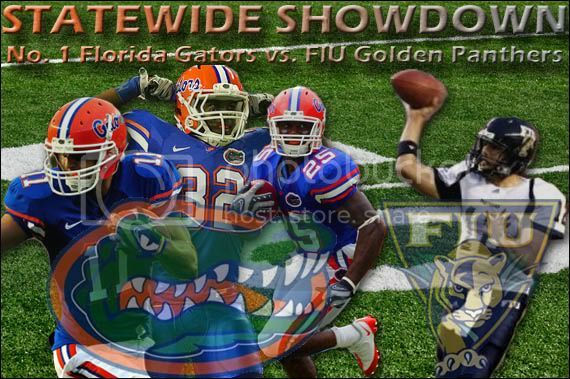 1 Florida Gators (10-0, 7-0 SEC) return to the friendly confines of Ben Hill Griffin Stadium on Saturday, playing in their first of a two-game homestand and senior sendoff against the Florida International Golden Panthers (3-7, 3-4 Sunbelt). This game marks the first-ever meeting between the two schools. OGGOA is featuring three of Florida’s seniors this week – kick returner Brandon James, wide receiver Riley Cooper and linebacker Ryan Stamper – all of whom have played big roles while in the Orange and Blue both this season and for their careers. James is looking for a kick return touchdown today while Cooper hopes to improve off his performance last week and Stamper tries to add to his team-lead in tackles. This week, the Gators look continue their impressive winning streak while also becoming more fluid and confident on offense. Under heavy scrutiny all season, the offense could get back on track just in time for its rivalry game against the Florida State Seminoles game next week. 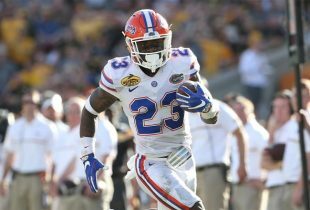 Florida is taking this week to get some of its best players healthy, including redshirt juniors transfer running back Emmanuel Moody (ankle) and defensive tackle Terron Sanders (rib), who are both out for the game. Senior defensive end Jermaine Cunningham is questionable with a shoulder injury while junior cornerback Moses Jenkins is unreported (out indefinitely) with a concussion.